next April 9, 2015 1:17 p.m. Occupation: Founder of audience.io and curator at Summit Series. There are just a handful of things in life that I do every day: sleeping, eating well, journal writing, and practicing both yoga and meditation. My love of and need for daily yoga and meditation started right around the time I became fully immersed in the world of technology, so it was only natural that I turned to apps and web products to help me learn more about the world of wellness. The intensity of living and working in the online world made yoga and meditation that much more necessary to feel balanced. 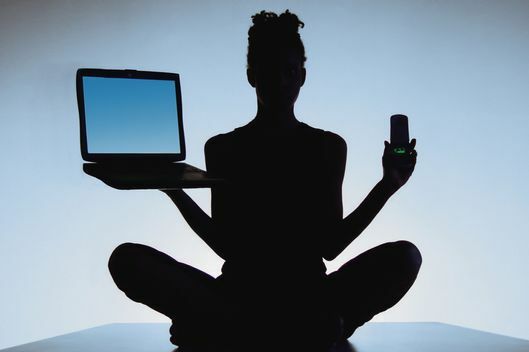 The irony is that as an early adopter of these spiritual practices and tech, I often turn to technology to help me break away from technology. I may never get over how much I love the name of the app's domain. It’s just Calm dot com. So good! It was founded by my friend Michael Acton Smith*, and it’s actually the app that helped me get started with meditation in the first place. Its five-minute guided meditations are a great way to dip your toe in the water with a calming voice that leads you through mental exercises with themes like Confidence, Compassion, and Gratitude. Now I simply use the timer for 10 to 20 minutes, which provides a beautiful background noise, like a mountain spring or the beach, and a Buddhist bell at the end to signal when time is up. I first learned about the Buddhify app when I was living in London and met its founders. What I like about this iPhone app is that it offers dozens of guided meditation options specific to nearly every life scenario. For example, if you can’t sleep, Buddhify has calming meditations designed to help you pass out. If you’re taking a quick break from work, it has ones designed to help you find your center and refocus. Buddhify also makes it easy to track your progress through weekly stats and personal record streaks — like the number of days in a row I’ve meditated. All my friends from L.A. to London love Headspace, and if you need a meditation app to help you stay on track, this is it. Their free introductory content offers a new guided meditation each day for ten days. After that, you can pay for certain packages and stay on tracked meditation paths based around themes such as Foundation, Health, Relationships, and Performance. They are all guided by Headspace’s co-founder Andy Puddicombe, who is a former Buddhist monk. As an early adopter of Headspace, I’ve wrangled myself a free lifetime account. (I found this app while living in London, where its other co-founder Rich Pierson is from.) But, as a hot tip, you can catch Puddicombe’s lessons for free on any Virgin Atlantic flight! I first met Ryan Weiss, a meditation and Kundalini yoga instructor, in Eden, Utah, at a Summit Series–hosted weekend. I love the combination of physical activity, intense breathing exercises, storytelling, and meditation in his classes. His daily newsletter Waking Up With Ryan offers short, sage stories that are so beautiful, they could double as song lyrics: "Open wide. Ground your feet. Bring on the discomfort. Let it rock you. You'll be glad you did on the other side." Reading his email is my favorite way to start my day, and the only reason to check my in-box before punching the proverbial clock. I first became aware of Mindbody from dropping by yoga studios — it’s the go-to studio software for booking and scheduling. A few years ago, they also released an app for normal people: Mindbody Connect lets you search for different yoga- and meditation- related classes right from your phone. It’s super-useful when I’m traveling to a different city — say, San Francisco or L.A. — and want to find classes nearby. In the past several years, the number of online yoga classes has exploded. It’s now easy to practice yoga from anywhere as long as you have your laptop in tow. I find myself using Yogaglo when I’m home in the States, and Movement for Modern Life* when I frequently find myself in the U.K. Both platforms offer unlimited monthly online yoga for about the price of one drop-in visit at a physical studio. Yogaglo’s Yoga for Balance is great for when you're just waking up in the morning, and sets a foundation for your day. This method obviously doesn’t have the same energy as a physical studio visit, but it is so convenient when you are working from home or on the road. I first heard about Yogaglo from my yoga instructor, who told me it’s the only technology-related service she uses for yoga. I first heard about the Yoga Studio app from the Twitter handle @HustleandKale — a great resource for healthy tips if you're a hustler. It comes with 65 video classes at a variety of levels for a very reasonable $3.99. I love that you can choose from 15-, 30-, or 60-minute classes, from categories like strength, balance, flexibility, or relaxation. This makes it useful for filling whatever random time slots I happen to have free with quick classes such as Yoga for Runners. And the app is great for traveling abroad, as you can download any of the prerecorded classes with Wi-Fi for offline usage when you’re deep off the grid. This past December, I hosted a tech event at the Soho Beach House in Miami. It was there that I met Liforme founder James Armitage, who was visiting from London. He kindly gifted me one of his awesome yoga mats, which is by far the most technically advanced mat I’ve ever used. It manages to stay ridiculously grippy — even when I’m a sweaty mess. I also like its deep cushioning, which makes it easy to stay stable during poses, and that it’s a few inches longer and wider than a standard yoga mat. 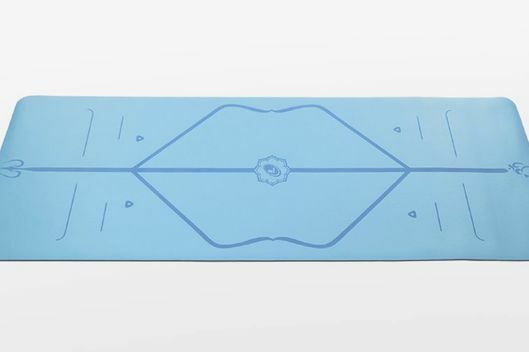 It also offers alignment markers, which are very helpful for those new to yoga. Oh, and it’s sourced from sustainable rubber, without any nasty glues. I always check Product Hunt, which is how I find out about new start-ups just as they’ve launched. I’m also a big fan of the old word of mouth, and love grabbing my friends’ phones to see which apps are taking up the most valuable real estate on their home screens. Other than that, if I’m ever in need of a new app, I turn to Twitter or Facebook and ask for advice. I first saw the SmartMat at CES this January. 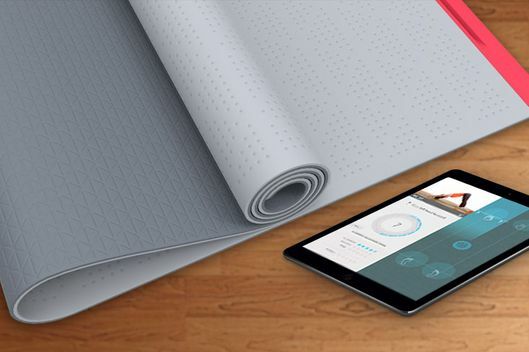 It’s a portable yoga mat that helps with your yoga practice by tracking your movements and suggesting incremental improvements via a connected app. If the mat is all it’s cracked up to be, a robot may have just replaced your private yoga instructor. There’s a Kickstarter currently raising funds called Prana, which is a wearable device that helps you improve the quality of your breathing and posture. I imagine most people who use this will be shocked to learn how much they need to improve their breathing, and what a big impact taking a few deep breaths every hour can have on your productivity and wakefulness. If you want this functionality now, there’s also a clip-on fitness tracker called Spire that is currently available. It tracks your breathing, which is vital to effectively practicing yoga and meditation. The dream would be to have a personalized health-monitoring app on my smartwatch that reads my biometrics and delivers feedback in real time. So it would tell me when I need more sleep, more protein, more water, or when to put down that third glass of wine. We can read many books about healthy cleanses or pay closer attention to our bodies, but really, we’re still fumbling around in the dark when it comes to making the right decisions for our physical health. I think the SmartMat sounds incredible, but just as Moore’s Law takes into account the size of computer-processing parts, I want yoga mats to follow suit so I can have one that plays my favorite yoga playlists on SoundCloud as I practice — and then rolls up into the size of a pen for when I travel. *This article has been updated to correct the name of the founder of Calm (he is Michael Acton Smith) and o fone of the online yoga class providers (it is Movement for Modern Life). 4/10/2015 at 6:00 p.m. Good-bye to Next! Sometimes the future comes faster than you think. We’re not predicting that you’re going to become a Luddite. Everyone holds on to some of the habits of their youth. And their children inevitably make fun of them for it. The Aurora will perform calculations so quickly it will be able to model complex systems like nature, the universe, and the human body. The future of medicine, if doctors have their way, will involve getting people to monitor their health without thinking much about it. "We believe that words on the page will endure long into the future." If SpaceX succeeds in creating a reusable rocket, it will be a huge step toward dramatically reducing the cost of space travel. Autonomous killing robots have not yet been deployed in war zones. They will be soon, though. Instead of putting your life on hold to see a doctor, why not pull one up on your mobile phone? 4/9/2015 at 5:25 p.m. How Long Before Silicon Valley Can Produce Fake Meat That Tastes Like Real Meat? 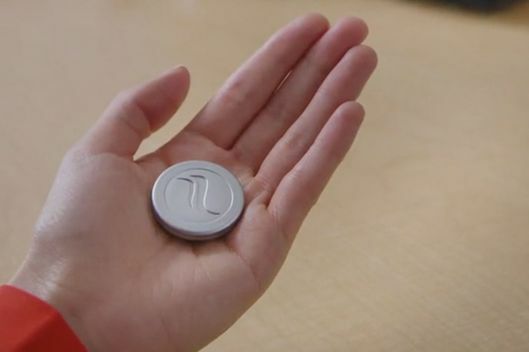 An invisible button that feels like a real button is much easier to push. "As an early adopter of these spiritual practices and tech, I often turn to technology to help me break away from technology." Times Square has always been about reinvention — no matter what state it's in, we can't help imagining what it could look like in the future. Tomorrowland, Disney’s big-budget summer blockbuster that's based on the future-themed parts of its theme parks, comes out in a month. "On some level, English appears to be getting homogenized." Space suits will largely be worn by astronauts for a long time coming, so Final Frontier Design's products will have a second life on Earth — as gear for tech-savvy, fashionable New Yorkers. Baking just got a lot more complicated. The resolution wars are heating up: Tech companies are racing to build devices with screens so clear, so colorful, and so advanced our eyes might not even be able to discern how great they are. The key to this life-altering technology is one simple metal — aluminum. What will people invent in the next 100 years? How will they dress? What will they do for fun?